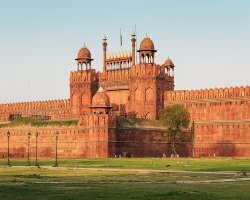 The Red Fort or Lal Quila is a historical fort complex located in Old Delhi (earlier known as Shahjahanabad) in Delhi, India. Enclosed by the massive walls of red stone, this architecturally beautiful historical fort was constructed by Mughal Emperor Shah Jahan who also built the world famous Taj Mahal in Agra. The emperor commissioned the construction of the Red Fort on 13 May 1638, when he decided to shift his capital from Agra. The fort took 10 years to construct and was completed on 6 April 1648. The historical Red Fort in Delhi was the main residence of the emperors of Mughal dynasty for around two hundred years, until 1857. There are several museums inside the fort complex that showcase the artifacts and tell the saga of Mughals. The historical Red Fort witness a proud moment on every Independence Day of India, 15 August. On this day the Prime Minister of India hoists the Indian “Tricolor Flag” with great zeal and enthusiasm; and them delivers nationally-broadcast speech to the Indian people from the fort’s ramparts. In the year 2007, the Red Fort Complex was designated as a UNESCO World Heritage Site. Throughout the year, people from different parts of the world make visit to this cultural heritage site in Delhi and explore the brilliance red sandstone structure of the fort complex. The fort complex depicts the high-level of ornamentation. There are several stunning structures and places inside the Red Fort Complex which grab the attention of tourists. Walls, ramparts, gates, halls, courtyards, palaces, and apartments are the most important surviving structures within the fort complex you can see and explore on your visit to Red Fort in Delhi. Gigantic Gates: There are two gates for entrance into the Red Fort Complex, namely Lahori Gate and Delhi Gate. The Lahori Gate is the main gate to the magnificent Red Fort. It is the gate where every year on Independence Day, the Indian national flag is unfurled and a speech from its ramparts is made by the Prime Minister of India. The Delhi Gate is the southern public entrance gate to Red Fort. It is similar in layout and appearance to the Lahori Gate. Chhatta Chowk: Chhatta Chowk is an important place to see inside the fort complex. Adjacent to the Lahori Gate, it is that place for bazaar where jewelry, silk, and other items for the imperial household were sold during the Mughal era. This bazaar leads to an open outer court. And the southern end of the bazaar street is the Delhi Gate. Diwan-i-Aam: The Diwan-i-Aam (the Public Audience Hall) is one of the main structures inside the fort complex which you will certainly like to see. Roaming around this place will provide you an opportunity to see fine craftsmanship in hall’s columns and engrailed arches. This hall was used for the state functions and making interactions with common peoples. The courtyard behind the Diwan-i-Aam leads to the Mughal imperial apartments. Mumtaz Mahal: The Mumtaz Mahal is one of two zenanas (imperial women’s quarters). At present, this beautiful palace houses the Red Fort Archaeological Museum. The museum contains artifacts, paintings, fabrics, curtains, carpets, swords, daggers, cushions, pillows, calligraphy, rose water sprinkler, and other objects dating from the Mughal kingdom. All the objects here are demonstrated very systematically in six galleries belongings to Mughal era. Rang Mahal: The Rang Mahal is one of imperial women’s quarters that housed emperor’s wives and mistresses. This beautiful palace is beautiful painted in bright colors and decorated with a mosaic of stunning mirrors. This is why this palace is given a name of Rang Mahal, the Palace of Colors. There is a central marble pool in this palace which is fed by the Nahr-i-Bihisht.